Even though I've been busy chipping away at my custom order list, and I still have lots to do, I decided to squeeze in a project for myself. My yellow and blue rag-style purse is pretty, but just totally out of season. 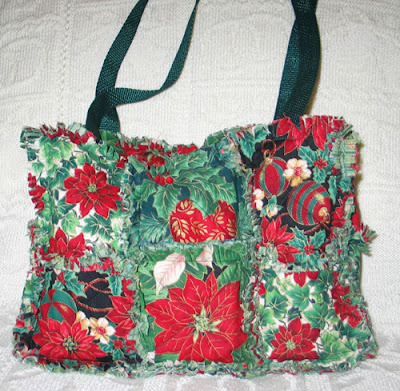 So I decided to make a new rag-style bag with Christmas fabric. 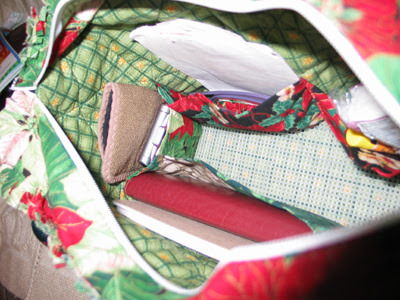 These fabrics came from a fat-quarter bundle I bought years ago and never used. 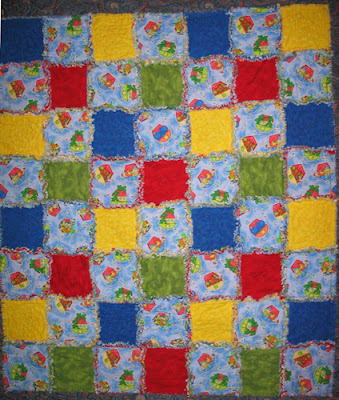 It was nice to have a set of fabrics that went well together. 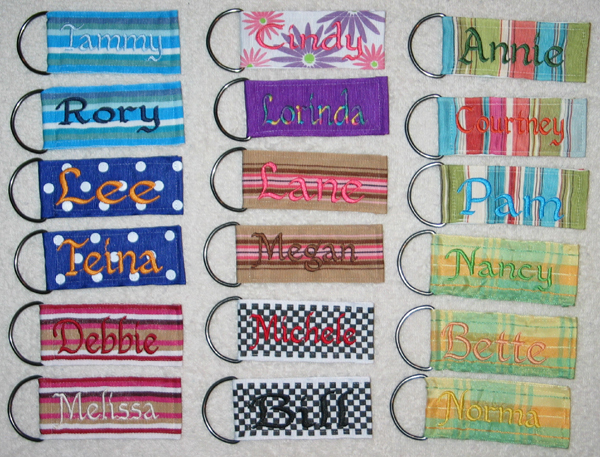 Since I didn't have yardage of any of these prints, I couldn't easily make handles. I purchased some green webbing to use instead. That sure saved time! 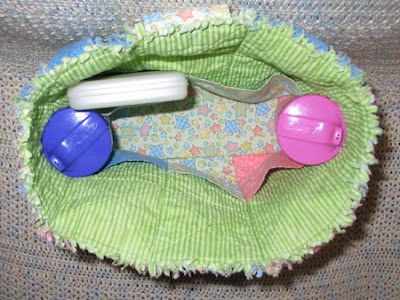 A customer has asked me about putting a zipper in a rag-style bag. I told her I would experiment before committing to it. I spent a couple weeks brainstorming how to make it work and didn't come up with a good solution. This weekend when I was talking about it with Valerie, she suggested making a top panel the same size as the base and put the zipper down the middle. What a genius! It worked perfectly! This will especially make Carlin happy -- he complains about how stuff spills out of my bag if it tips over in the car. 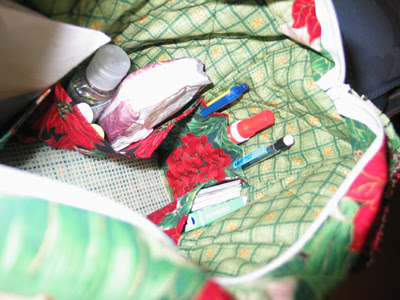 And here's a look inside a filled purse. My wallet and another little zippered bag sit in the middle. 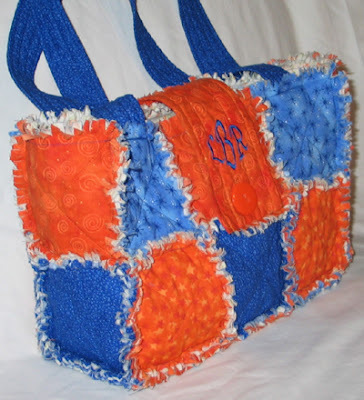 A friend (whom I will allow to remain anonymous) requested an orange and blue rag-style bag for her Gator sister-in-law as a birthday gift. One of the benefits of being from another state is that I don't have any strong allegiances around these parts, so it didn't pain me to make it as much as it did her to order it. I think it turned out really cute. 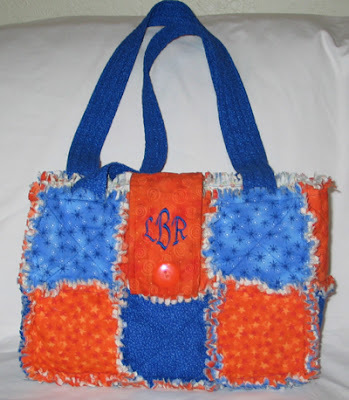 Fortunately it is the wrong orange and blue, so I wasn't tempted to keep it as an Illini purse for myself. I made the tab closure wider than my previous purses and put the monogram on it (using Embird Alphabet #33). 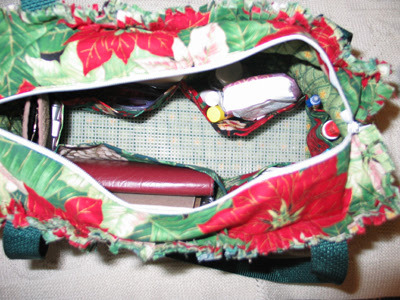 The inside features several pockets. 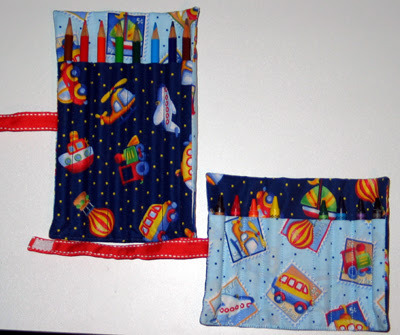 Each bag I've made is an improvement on the last, and I think I've finally settled on a standard set of pockets. 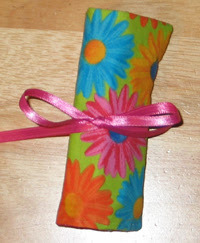 One side has a 4" and an 8" pocket (the 8" is perfect for a checkbook, 4" can hold a cell phone, sunglasses case or keys). 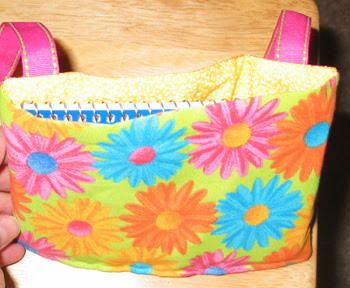 The other side has two 6" pockets (for wallet or whatever else fits). Both ends have a pocket as well, and for one of them I added two lines of stitching to create a place to store pens/pencils. I've got another bag cut out to make for myself. Hopefully I'll have that done in the next couple of days. 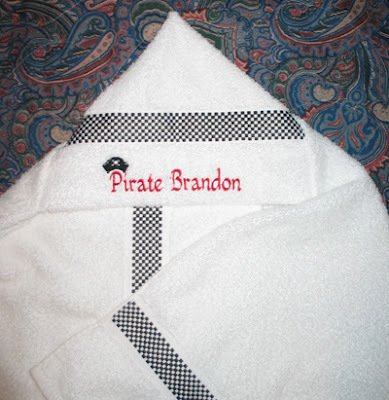 Hooded Towels for more grandkids! 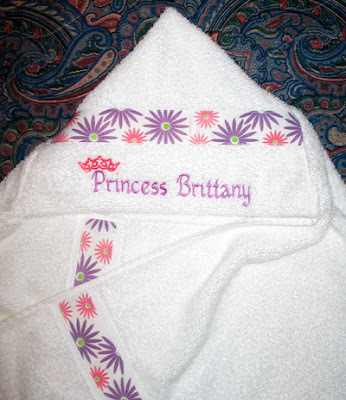 Jan ordered two more hooded towels to give as Christmas presents to the rest of her grandkids. I got them done today so I can deliver them to Jan while she's in town visiting family instead of shipping them down to her home. Saves time and money for all! I used Embird Alphabet #33 for the text. The crown is the same one I've used several times. The pirate hat came from Sew Forum. 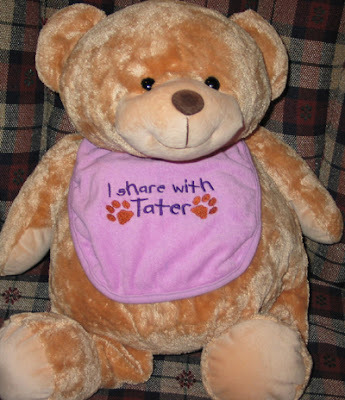 The second requires a bit of explanation: "Tater is our pug and hangs out under her high chair for dropped goodies." Hee hee... 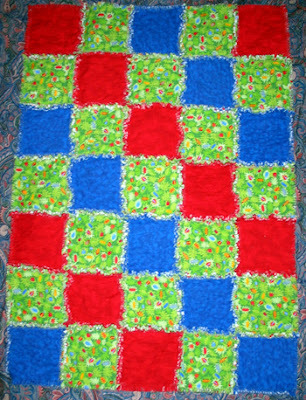 The text is Embird Alphabet #18, and the paw prints came from Sew Forum. The last few days I have been working my way through some custom orders (in addition to hemming a choir dress -- my first time tackling a project like that!). 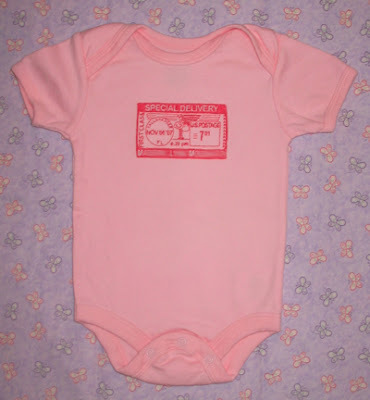 First up is a "Special Delivery" onesie that Michelle ordered for a new arrival. 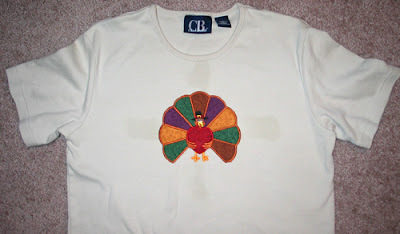 The design is from Sew Terific and I added all of the birth details with Embird Alphabet #2. 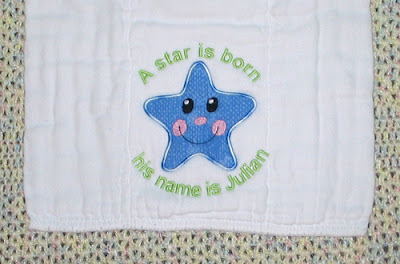 Next is a burp cloth that Kristen ordered for yet another new arrival. 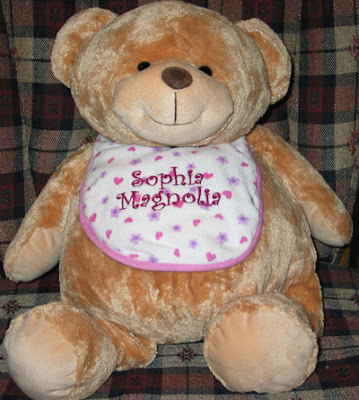 She requested one like I had made for Hudson. The applique football is from Embroidery Garden (off of a freebie football sucker holder available on her yahoo group). I added the name with Embird Alphabet #2. 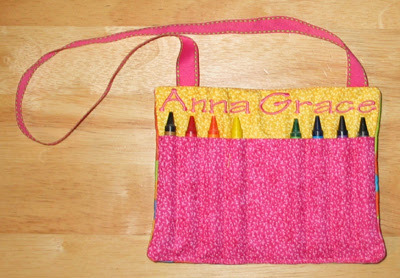 And finally I made a crayon purse and a crayon roll, both personalized. 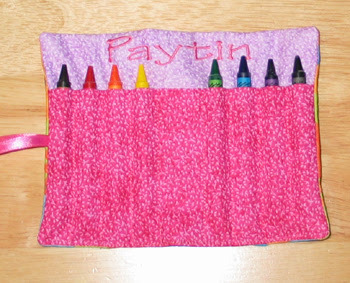 The design for the crayon holders came from Sewing For Sarah. 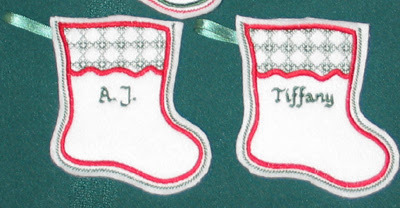 I added the names with the Tinker Toy font, posted on Sew Forum. Madison Cheers on the Noles! 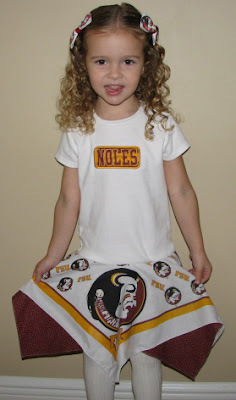 Here's a picture of Madison in her FSU Bandana dress that we gave her for her birthday. Looks like it fits now with room for growth next spring. Whew! 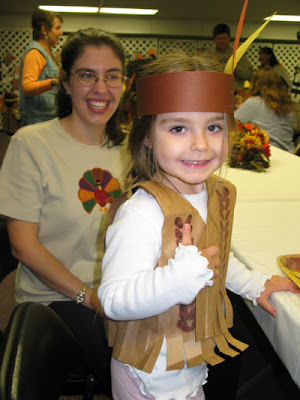 Our Thanksgiving Feast at Preschool is this Friday. 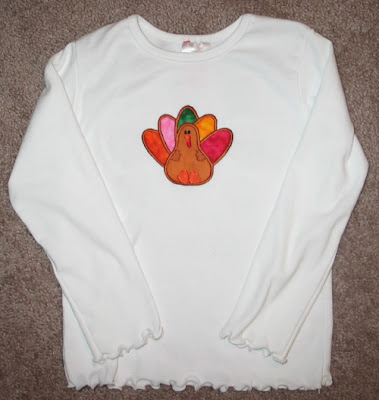 Today made turkey shirts for Annaliese and myself to wear. I decided against making identical ones like I did for our pumpkin tops. Here's a sneak peak... better pictures (like after they dry!) will be forthcoming. I made my shirt first. The design is from the San Francisco Design Co. and is actually free right now. It stitched out pretty well. 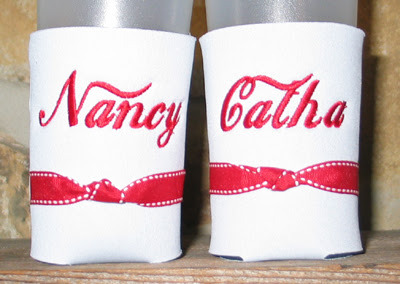 There are a couple of stitching errors, but no complaints from a free design! 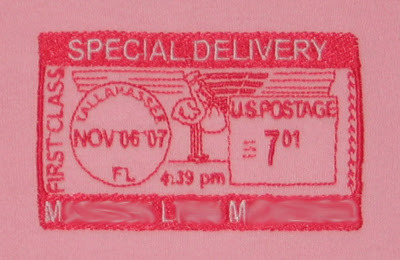 The design on Annaliese's shirt came from the Embroidery Market. 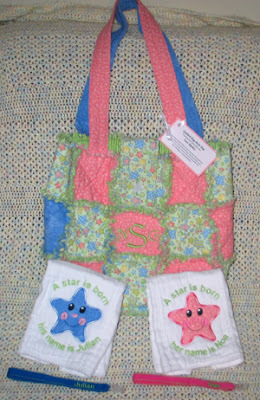 Now that I have those out of the way, I need to focus on several orders... special delivery onesie, personalized burpcloth, crayon holders, bibs, a rag-style bag... hopefully I'll have lots of pictures to post over the next few days. Happy Birthday Roberta, Jesse and Jake! WOW! It seems like half of Annaliese's friends were born within the first 5 days of November! That makes for lots of birthday gifts! 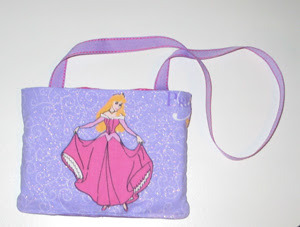 Roberta turned 3 and loves princesses, so I made her a crayon purse and put Princess Aurora on the pocket. It was so fun to watch her open it in person -- she liked her name and the crayons, but when she flipped it over and saw Aurora, she was ecstatic! It was precious. Both Jesse (church friend) and Jake (preschool friend) turned 4 this year. 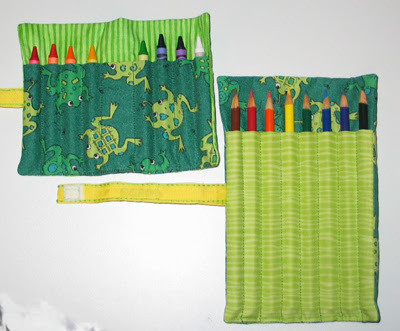 I made them each a pair of crayon and pencil rolls. 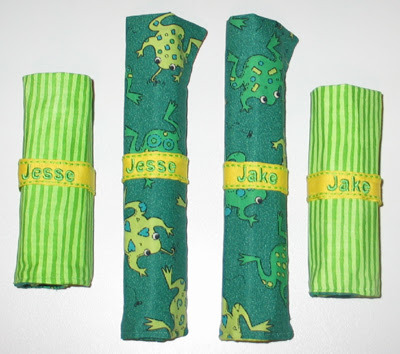 Jake, his brother Brodie and mom loved them so much that they ordered a set for Brodie, too! I got those done this weekend and will deliver them tomorrow. Loads of Gift Card Holders! Well, I couldn't get my Giga Hoop to work last night, and didn't have time to figure out why. It really wouldn't have saved me a ton of time anyway, so not that big of a loss... for now. 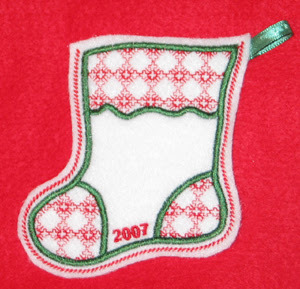 The mitten gift card holders are basically all the same, green and white on red. 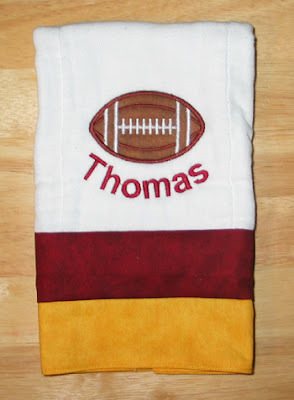 The stockings have lots of variations: some traditional Christmas colors, colors for little girls and boys, and then of course colors for the Noles and Gators! I also want to offer personalized gift card holders, so I need to take examples. I chose Tiffany and A.J., in honor of Tiffany's comments on this blog. 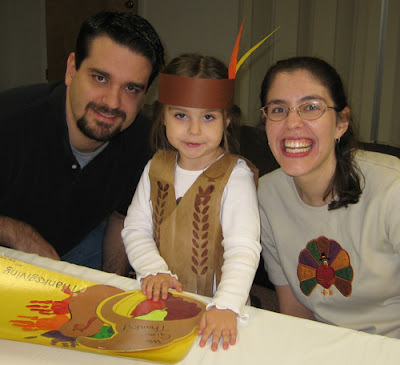 No, this isn't a payoff, just a small token of my gratitude! I'll give them to you after Sunday's craft booth at Southwood. When the weekend is over I'll post more details on where the design came from and how they are constructed. Once I return from church tonight, I plan to tackle more of these gift card holders. I'm going to attempt to use my GigaHoop for the first time to do 4 at once. They are super cute! More design details later! Here are the pacifier clips I have made over the last few days in preparation for my two shows this weekend. 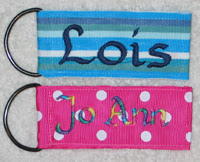 And I can take orders for personalized pacifier clips, $8 each. Anna is being nice enough to let me display the ones she ordered for her future nieces before I mail them off! A while back I set up a YouTube account so that I could subscribe to videos (especially ones that Carlin was posting which were not available to the public). Carlin decided to make me a little video so that my YouTube page would have something on it! The only thing we are not sold on is the very end. We settled on "Janay's Stitches", but that's open for suggestions. I'm not very creative when it comes to wordsmith sort of stuff. I challenge you to help us come up with something better! I'd love to use either my initials (KJT) or Janay or Trammel, but I'm open to anything! 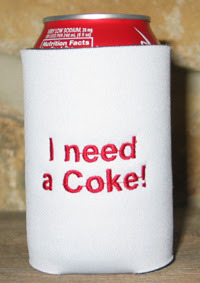 These are not items that I have made, but that I have available for purchase! My sister-in-law makes fantastic headbands, and today I received a shipment from her. 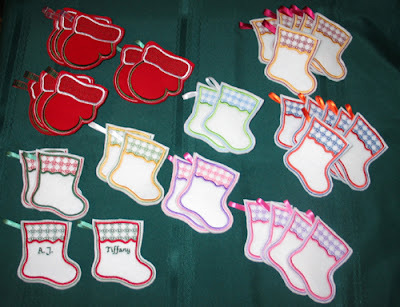 I am taking them with me to the "Christmas at the Holiday Inn" event that I am a part of this Friday. 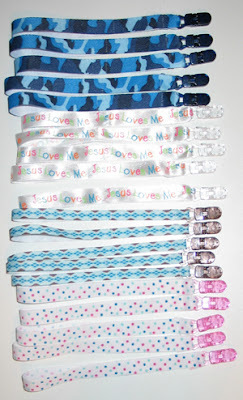 She has made headbands for Noles, Gators and Tigers; we have patriotic and Christmas themed headbands, as well as an assortment of other colors. 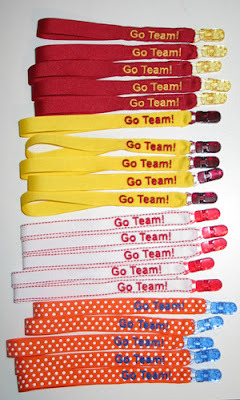 Let me know if you'd like to claim one or more before Friday! Be sure to click for an enlarged picture. Tori recently had her boy/girl twins, and today was her baby shower with the women at Timberlane CoC. 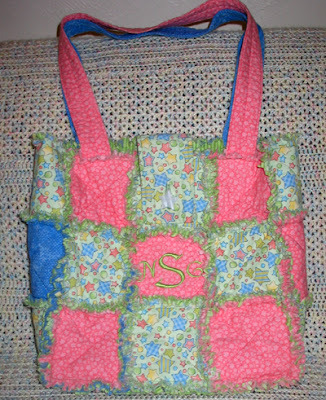 Several weeks back Melissa commissioned me to make a diaper bag like my rag-style purse. 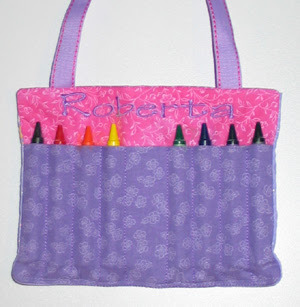 She wanted girl colored fabrics on one side and boy fabrics on the other. I found a cute print and picked out a blue and pink calico that would match. I monogrammed the babies' initials on each side. 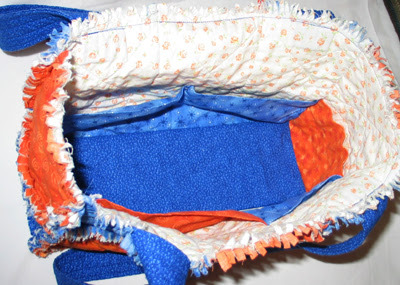 The inside features several pockets. Two are the right size for a wipes container and a small stack of diapers. I hope the two on the ends hold bottles... I don't have any laying around here to check, but Annaliese's platex cups fit! Even if it isn't the most functional diaper bag early on, Tori will be toting stuff for her twins for several years to come! Melissa and a few others went in together to get the bag and fill it with lots of good stuff. 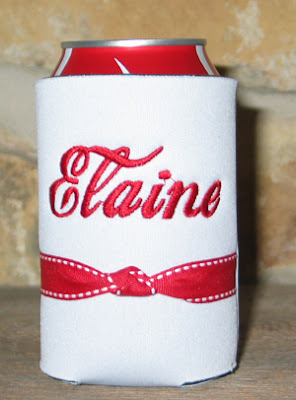 I decided I needed to make a few more personalize items to coordinate. 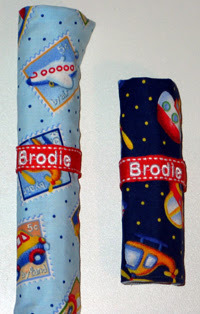 I did two pacifier clips, which I posted earlier, and these two burp cloths. 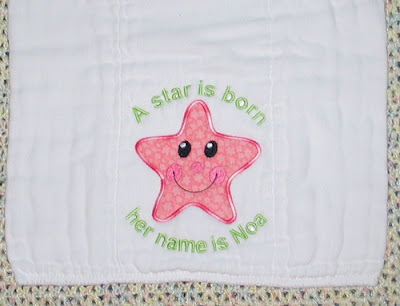 The applique star design came from The Embroidery Market (actually I think it was a freebie from the yahoo group). 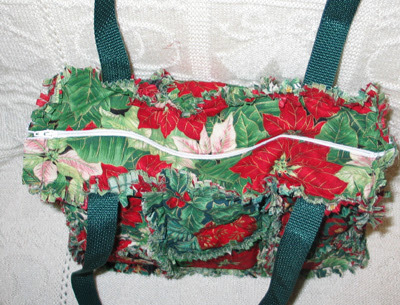 I used the same fabrics as in the diaper bag and variegated threads for the satin stitch. 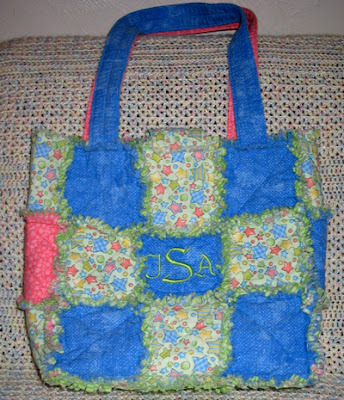 The text was added with Embird Alphabet #2, and I used the same thread color as their monograms on the bag. It turned out to be a nice ensemble.